The common law of England was developed gradually over the centuries. It was also exported to Commonwealth countries with which England was involved during its days of Empire, as well as to what became the United States of America. Over the years these countries adopted this common law to suit their own legal systems, but many of its essential elements survive to this day in 'common law' countries. One of these elements is the doctrine of precedent – decisions of higher courts interpreting the law being binding on lower courts. This led to the widespread reporting of higher court decisions, so that other courts could consider if the facts of the case they were dealing with approximated to the higher court case which regulated the particular law in question. These reported court cases, where they involve aviation matters, can often be an excellent source of information on individual aircraft, a veritable gold mine for enthusiasts seeking data on the history of a particular aircraft! Just such a case is that of John R. Gasho and Sharon Gasho vs The United States of America and Northrop Worldwide Aircraft Services Inc, a decision of the United States Court of Appeal, decided on 2nd November 1994, reference 39 F3d 1420, to give the case its official citation. The excellent Air Britain DC-3 monograph is of course 'the bible' when it comes to information on the DC-3, but this case does add a little to the monograph by way of background and data on a particular aircraft, in fact a C-117D Super DC-3. The subject of this court case started its life as a Douglas R4D, delivered to the United States Navy in November 1943. It was one of a hundred such aircraft converted to R4D-8 'Super DC-3' configuration and re-delivered to the Navy in January 1952 with tail number 17116 (c/n 43307). It served first at El Toro in California and in subsequent years travelled the globe, being based next in Atsugi, Japan, Grosse Ille Michigan, then to Naples, Italy and Kenitra in Morocco. It was re-designated as a C-117D in 1962 and eventually arrived in England in December 1971, following its posting to the Mildenhall Naval Air Facility, where it joined sister ships 17171 and 17191. Its taskings in support of the Navy in the European theatre brought it to airfields throughout the UK and Continental Europe, becoming a firm favourite with the enthusiasts of the time. Its stay in Suffolk was not all that long, less than two years. By that stage the days of the 'Super Gooney' in Naval service at Mildenhall were numbered, as they were replaced by Convair C-131s. 17116’s service there came to an end in October 1973. By then sistership 17171 had already been assigned to Keflavik. On 6th October 1973 17116 left Mildenhall for the last time, flying to Prestwick and then onwards across the Atlantic also on delivery to the Marines at Cherry Point. Having arrived at its new base, it adapted the unit’s CN tail code and flew from Cherry Point for the next five years, until finally withdrawn from military service in December 1978, and flown to 'the boneyard' at Davis-Monthan AFB, Tucson, Arizona. Here it was parked in the storage compounds alongside dozens of other C-117Ds, whose military careers had also come to an end. Many of these however, including 17116, would go on to more years of productive use as civilian freighters. Davis-Monthan is of course well known to aviation enthusiasts worldwide, and a place of ‘pilgrimage’ to witness the awesome spectacle of many thousands of retired military aircraft in repose. Large numbers of these are broken up for their metal and spare parts but others are recycled and fly again as military aircraft or are sold on the civilian market. To cater for this business numerous concerns set up shop around the perimeter of the Air Base, both to wield the breaker’s axe and to process aircraft back into the air. The dusty desert roads of Kolb and Wilmot, where most of these businesses are located, have been well travelled by enthusiasts for years. One such business, with an address at 5951 South Wilmot was Western International Aviation, and its president was John R. Gasho. It had been established in 1983, and was located in the yard where Time Aviation previously carried on business. At this point in the narrative it is necessary to relocate from Arizona’s Sonora desert, several thousand miles to the north-east, to the cosmopolitan metropolis of Toronto, Canada. This was the home base of Millardair, a cargo charter airline founded by Carl Millard in 1954. It had prospered and by the late 1970s operated a fleet of five DC-4s, nine C-47s, five Beech 18s as well as smaller aircraft. Millardair flew a lot for the motor industry, as well as all manner of general cargo and livestock. As the C-47s were showing their age, Millardair decided to replace them with more modern equipment, the C-117D, proving the old adage that the only replacement for a DC-3 was another DC-3! There was a ready supply of C-117Ds available from Tucson and the first two arrived in Toronto in December 1983. In all six 'Super Daks', as they would be called in Europe, were acquired, the remaining four being sourced for Millardair by Mr Gasho. The final aircraft of the order was the former 17116 which, as we have seen, was retired to the boneyard in December 1978, where it remained in storage for some years. In August 1985 it was sold on the civilian market and registered N116DT to a company called Lan-Dale Co of Reno, Nevada, a company used to buy aircraft out of the storage compounds. It was registered to Mr Gasho’s company Western International Aviation on 6th November 1986 and was the last of the four C-117s he supplied to Millardair. To turn now to the court case involving this aircraft, it starts off by reciting: "John and Sharon Gasho, his wife, own an aircraft restoration company in Tucson, Arizona. On 24th June 1988 the Gashos flew a McDonnell Douglas DC-3 aircraft (in fact, a C-117D) to Scottsdale Municipal Airport in order to meet with a Federal Aviation Administration (FAA) inspector. The Gashos were selling the aircraft to Millardair, a Canadian corporation, and they wanted to terminate the United States registration of the aircraft before export". Scottsdale was a small airfield near Phoenix, Arizona. The Gasho’s daughter practised in the city as an attorney. It was to be an eventful day for Mr and Mrs Gasho, and they would require their daughter’s professional services before the day was out. At first all went well. They met the FAA inspector. They processed the documentation, as they had done with the aircraft they had already sold to Millardair and received a special flight authorization allowing the aircraft to be flown to Toronto with Canadian marks, registration C-GJGQ having been reserved. The Gashos and the FAA inspector removed the US registration and affixed the Canadian marks to the aircraft. His business completed, the FAA inspector went on his way and the Gashos retired to their hotel room. It was at this stage that the downward spiral started. An air traffic controller in the Scottsdale Tower noticed that the registration marks on the C-117 had been changed and, for reasons best known to himself, decided that there was something wrong or suspicious about this when, of course, there was not. It had been an entirely proper and routine transaction carried out with a US government official. But the tower controller contacted the US Customs post at the airport and voiced his suspicions. The man in charge there dispatched two 'special agents' to investigate who, again for no good reason, decided that all was not as it should be. The two agents confronted the Gashos in their hotel room. The Gashos explained the entire transaction to this pair and showed them the documents, proving all was in order. Evidently of a very suspicious bent, they continued to believe that wrongdoing of some sort was taking place, and would not believe a word of what they were told. They proceeded to read the Gashos their rights. At this stage the Gashos summoned their daughter, the attorney, to assist them. The FAA inspector had left and could not be reached. The agents placed a lock on the propeller, believing they had probable cause to seize the C-117 for the 'knowing and wilful display of false or misleading markings'. After this, matters continued to deteriorate. Having seized the aircraft for no good reason, the agents gave permission to Sharon Gasho to enter the C-117 to remove personal belongings and the aircraft’s radio. The agents did not tell her that any items inside were seized. Among the items she removed were the aircraft’s logbooks. She then exited the aircraft carrying the items in a plastic bag. At the time her husband and the agents were standing on the tarmac beside the C-117. In the presence of the agents, her husband asked her if she had removed the logbooks and she confirmed she had. All concerned then walked inside to the Scottsdale Aviation Centre to make photocopies of the FAA documents. At that stage the agents demanded that the Gashos hand over the logbooks, claiming they had been seized even though they had made no effort to stop Mrs Gasho taking them. The agents threatened to arrest the Gashos if they didn’t hand over the logbooks! The Gashos refused to do so, stating that the customs agents needed a warrant to seize logbooks, which they didn’t have. The Gashos called the local police, but they refused to intervene. The Gashos were now in a private, glass-enclosed office. After several minutes the agents sought to enter the office. Although there was a dispute over whether the Gashos refused to open the door, the agents managed to get in and arrested the Gashos and paraded them through the airport lobby in handcuffs. The Gashos were booked for violation of a law which forbids unlawful removal of property from Custom’s custody. The agents contacted a United States Attorney for assistance with the prosecution, but when he heard the facts he told the agents the Gashos would not be prosecuted. Other Custom’s agents would not get involved as they did not like what was going on. One such agent later gave testimony that the only reason the Gashos had been arrested was because their refusal to hand over the logbooks had enraged the two special agents and to get some leverage to protect themselves 'in case of a lawsuit later'. After what must have been a harrowing day for them, the Gashos were released on bail but the C-117 remained impounded. It was handed over to Northrop Worldwide Aircraft Services by the Customs with instructions to look after it. A few weeks after the seizure, Millardair completed the Canadian registration of the C-117 as C-GJGQ. The United States Attorney declined to initiate forfeiture proceedings against the aircraft and advised Customs to release it. The Customs own lawyer agreed that the aircraft be released, but on condition that the Gashos absolve the customs agents from any civil liability. Mr Gasho told him he must be joking. Six months after it was seized the C-117 was finally released to Millardair and flown to Toronto. It was to be sixteen months after their arrest before the Gashos were told that all charges against them were being dropped. As might be expected, these activities of the 'special agents' were bound to have consequences, and they weren’t long in coming. The Gashos sued the United States Government seeking damages for false arrest, false imprisonment, intentional infliction of emotional distress and abuse of process. They also sued the special agents and their supervisor for arresting them without probable cause and violating their Constitutional rights. Millardair also sued, claiming damages as the delivery of their aircraft had been delayed six months. Northrop Worldwide Aircraft Services were also sued for damage incurred to the aircraft while in Custom’s custody. At the hearing of this action, the District Court ruled against the Gashos on all grounds. The Gashos appealed to a higher court and the wheels of justice ground slowly waiting for the appeal to be heard. In the meantime, John Gasho continued to run his business in Tucson. He is quoted in a July 1993 article from an aviation magazine: " ‘We buy some of these airplanes that look like derelicts and restore them for wealthy people who like expensive toys to play with’ says John R. Gasho, who heads Western International Aviation, an aircraft restoration company in Tucson. ‘We’ll totally overhaul this hulk, put on new props, instrumentation and electronics and make it into a marvellous plaything’, Gasho says of an old Navy Grumman Albatross he acquired from Davis-Monthan. ‘We just finished one about six months ago for a customer who uses it for fishing expeditions. Another fellow is touring around Europe and Africa’. A slow economy has dampened the US luxury airplane business but Gasho hopes that foreign buyers interested in old military cargo planes will keep his business thriving". End quote. The Court of Appeal eventually heard the case in March 1994 and gave its decision on 2nd November 1994. From a legal point of view it was a difficult case, as although the facts were straightforward, a number of laws gave the government and its representatives immunity from such claims, and the court had to balance the rights of the Gashos not to be treated in such a manner by officialdom while at the same time preserving immunity for government agents which they needed to do their job in genuine cases. After a lengthy review of the relevant laws, the Court of Appeal concluded on the facts of this case that the Gashos were entitled to pursue claims for false arrest and imprisonment and emotional distress, thus overturning the decision of the lower court. The Court of Appeal referred the case back to the District Court for further proceeding, eventually leading to an award of damages to compensate the Gashos for the ordeal they had been put through. It was December 1988 before the aircraft arrived in Toronto and it was then parked for quite a time while it was prepared for a return to service, only being ready for action in April 1990. It was still all silver and had not been painted into the company’s colour scheme. Sadly it would never be, nor would it enter service with Millardair, as the following month the company ceased trading. Millardair had been operating somewhat elderly equipment which required upgrading to comply with the airworthiness regulations of the day, and the money was not there to achieve this, resulting in the company closing its doors in May 1990. Its fleet went into storage, some in Toronto and some in Picton, Ontario where they would languish for some years. Two of the C-117Ds were sold off, leaving four in storage, including C-GJGQ in Toronto. Salvation of sorts for these four came in August 1995, when they were purchased by a company called Sky Freighters and ferried westwards to Nanaimo on Vancouver Island. Two of the four, C-GDIK and C-GDOG, entered service with the new company, still in basic Millardair colour scheme but with Sky Freighters roof titles. They were used to fly seafood from the Queen Charlotte Islands to Vancouver and to haul mushrooms from Terrace to Vancouver. A third aircraft, C-GGKE, was put into storage at Nanaimo, as was C-GJGQ, the subject of this article, although it was later ferried to nearby Victoria in May 1997. 'JGQ was used as a source of spares and eventually its two engines were removed to keep the two active aircraft flying. Unfortunately this transport of nature’s bounty did not prove profitable for Sky Freighters, which suspended operations during 1998. C-GDIK and C-GDOG, the two active aircraft, were sold and headed back east. By November 1998 they were registered to and in service with Gateway Aviation, based out of Branford, Ontario still in basic Millardair scheme but with Gateway titles. They were followed by C-GGKE in February 1999 after it had been made airworthy. Unfortunately there was to be no reprieve for our subject 'JGQ, which continued to languish engineless in the long grass at Victoria, BC, a situation which continued for some years, the aircraft gradually deteriorating. 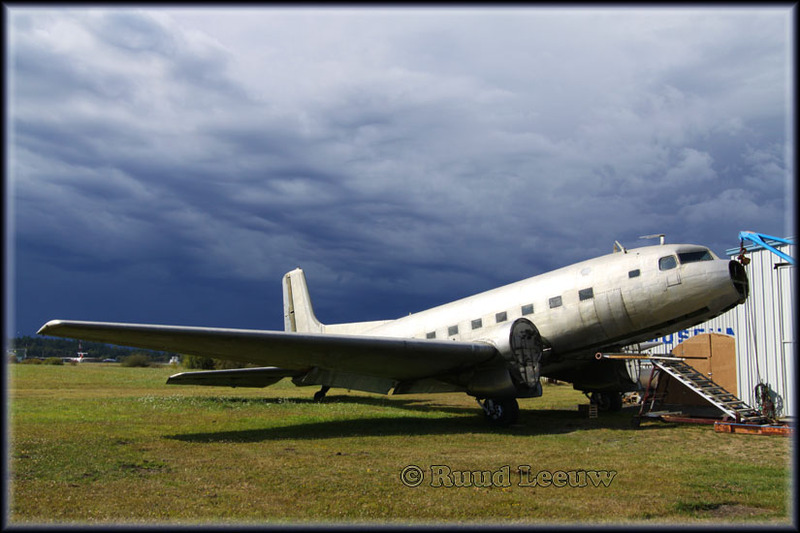 Douglas 'Super DC-3' (R4D-8, C-117D) 'CG-JGQ', c/n 43307 - rebuilt from DC-3A-456 (R4D-5) Bu17116, N116DT, C-GJGQ. 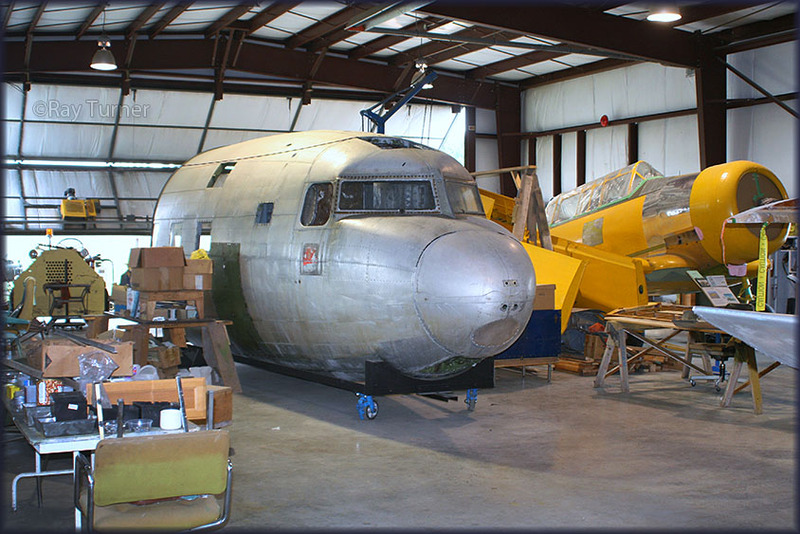 During Oct.2010 it was cut in half and the forward fuselage is expected to be preserved. It was acquired by the Victoria Airport Authority and registered to the Authority on 7th February 2008, although the registration was cancelled on 27t November ’08. It was eventually handed over to the British Columbia Aviation Museum at Victoria, who dismantled the aircraft during summer 2010, preserving the cockpit and forward fuselage as a museum exhibit and scrapping the rest. "Going through my DC-3/C117colour slides, I found a number of the Millardair/ Sky Freighter ones mentioned in Karl's article. In the fall of 1996, C-GDIK and C-GDOG regularly flew pine mushrooms out of YYD/Smithers, BC to Vancouver for further shipment to Japan. Around 15Oct96 'DIK caused a big mess there, when its starboard engine lost most of its oil when parked there on the tarmac. If I remember correctly, its port engine was u/s as well. Afraid this machine would become a permanent fixture, the Smithers airport managers kindly asked to remove this piece of visitor. N next slide, taken at Nanaimo,BC on 09Mar97, shows 'GKE sitting parked along the south end of the runway with its tail rudder missing. On 19Oct97, 'DIK, 'DOG and CG-JGQ were seen parked at the Victoria, BC airport. C- GGKE now sported a silver-coloured tail rudder. Starboard side of tail only showed the CG- part of its registration, while the port side showed the GKE part. On 19Nov97 I took a picture of C-GGKE sitting at a snow-covered Terrace,BC, when being used to fly pine mushroom south. Except 'JGQ, the other three all carried Sky Freighter titles, but were still in the old Millardair colour scheme. Note: plain silver-coloured 'JGQ carried as registration CG-JGQ instead of C-GJGQ." "Was interested to read Karl's article 'Bad Day at Scottsdale'. I have memories of the Millardair C-117s and I did see CG-JGQ in metallic a few times. My good friend Ray Turner and I visited Victoria B.C. on 14the June 2011 and during a visit to the British Columbia Aviation Museum we were shown around their workshops. The nose section of C-117 CG-JGQ was present having been removed from the main fuselage. Thought that you might be interested in Ray Turner's image taken that day."